El Nino is here, and investors in agricultural commodities stand to make a killing. 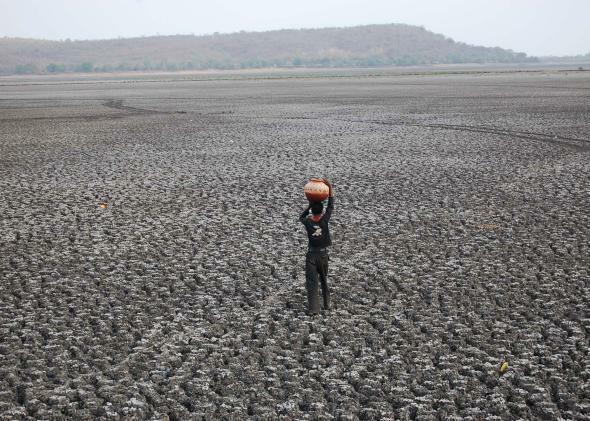 Forecasts say India may bear the brunt of this year’s El Niño, where it may be the driest monsoon since a major drought in 2009. For global investors, on the other hand, all the calamity could be a boon. El Niño is here, and this year’s version might be a doozy. Which is why red-blooded investors might be wondering, given the forecast: How can I make some quick cash? Well, one of the clearest predictable outcomes from El Niño is a general rise in weather extremes worldwide, especially in the tropics where most agriculture is still rainfed and El Niño’s weather-morphing power is strongest. That tends to make for less than ideal growing conditions for the major agricultural commodities grown there, like rice, cocoa, sugar, palm oil, and coffee—leading to a possible disruption to the global food market. If one chooses to act on this information, farmers’ losses can be investors’ gain. El Niño’s weather extremes tend to happen in a roughly predictable pattern, which is exactly the kind of heads up someone playing the market might be looking for. Last week, Jodie Gunzberg, a commodities expert at S&P Dow Jones Indices, did a crude analysis of how well commodities investments perform in the 12 months following the onset of El Niño conditions. Double-checking her numbers, I found that of the commodities indexes she listed (which includ energy, metals, livestock, and agriculture) only agriculture significantly outperforms the broader S&P 500 stock market index following an El Niño. During the year immediately following the past nine El Niño events, (1983, 1988, 1992, 1995, 1998, 2003, 2005, 2007, and 2010) the S&P 500 gained 16.5 percent on average. During those same calendar years, an investment in the S&P agricultural commodity index gained an average of 24.4 percent—a relative windfall. Looking a bit deeper, though, there doesn’t appear to be much of a link between the strength of individual El Niño events and increased return on investment: The three strongest El Niño episodes on the list above—1983, 1998, and 2010—resulted in the year with the best agricultural index performance (2010) as well as the only two years with a negative return (1983 and 1998). So consider these correlations with caution. Odds are, though, investing in agricultural commodities right now could fatten some bank accounts. Predictable El Niño weather patterns could help investors plan accordingly. Here’s why. 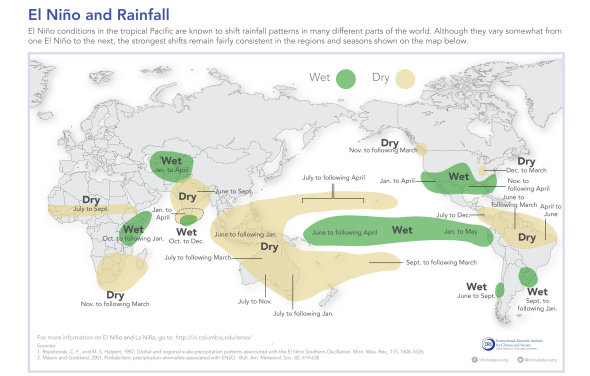 In India, Brazil, and Indonesia—some of the world’s most important agricultural regions—El Niño usually means drought. The typical boost in production thanks to generally good growing conditions in the United States usually isn’t enough to offset losses in other parts of the world, so a broad index of food prices tends to spike during El Niño years. Hence, some investors might buy up agricultural commodities early in the El Niño cycle. The last 12 months have seen Indian farmer suicides spike to new highs. A recent report on the tragic trend by BBC News cites a rash of extreme weather as a leading cause. And for some people, that same weather will make them a killing.